We're Moving to a New Office in Jupiter! We’re Moving to a New Office in Jupiter! Over the next couple months, our team at Precision Periodontics & Implant Dentistry will be moving to a new location in Jupiter. We look forward to this transition, as the new office will offer more space for our practice to grow. 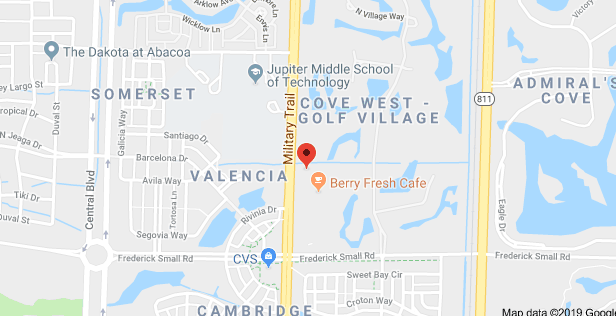 Although we are still operating out of our location in Palm Beach Gardens, starting in March 2019, you will be able to find us at: 3535 Military Trail, Suite 207, Jupiter, FL 33458. As part of our office upgrade, Dr. Daniel Lauer plans to install new technology that will enhance the diagnostic and treatment processes for many procedures. This includes “no-impression” digital scanning and 3D printing capabilities for surgical guides and temporary crowns, which will ultimately provide more comfortable and efficient visits for our patients. In addition to having a larger space that can better accommodate our team and state-of-the-art equipment, we are pleased to share that more parking will also be available at our new office location. Our goal is to make your trip to see our board-certified periodontist as pleasant as possible, which is why we are thrilled to announce our move to the new office. If you have any questions about our new office, or need directions for getting there, please feel free to contact us, and one of our team members will be happy to help you.